So you've decided to have a Steampunk themed wedding. Of course you have, because you're awesome, but the downside is that you can't just waltz into your local bridal boutique and find traditional pieces designed with a sci-fi aesthetic. If you are willing to do a bit of searching and go off the beaten path you can find or, better yet, create some really amazing favors for your guests so they always remember what a great time they had celebrating your big day. Choosing favors for your friends and family can be one of the most difficult parts of putting together a wedding. You want your guests to have something wonderful to remember your wedding but finding something that everyone will love that won't get thrown out or shoved in a junk drawer or closet can be almost impossible. Luckily the days of candles shaped like wedding cakes and engraved money clips seem to have gone by the wayside, giving modern couples some truly fantastic favors and other items to give their guests. While it isn't exactly a favor, the best place to begin embracing your theme is on your save the date cards. These are the first thing your guests will get in relation to your wedding so you will want to make them truly memorable. If your resources are limited and you want to spend most of your time and energy on bigger items like your dress or your cake you can order a simple set of cards printed with clocks, top hats, hot air balloons, or other similar images. If you want to add a creative flair to your cards you can embellish them with metal cogs, decorative keys, or other fun items that make them stand out. If you have the money you can even hire someone to design beautifully complex cards that embrace your love of all things Steampunk. 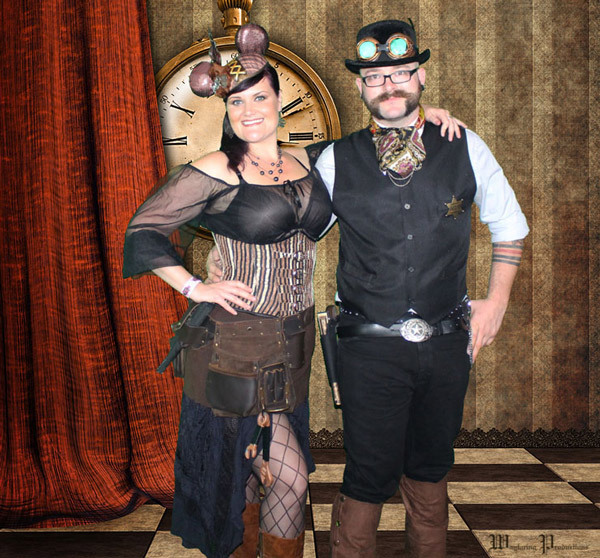 If you want something both simple and personal, any photos of yourself and your intended at a Steampunk convention or other event together can be used to create a unique save the date through an online image publishing company. This is an excellent way to show your guests exactly what they can expect at your wedding. Typical wedding invitations are written with beautiful calligraphy and printed in the chosen color scheme for the big event. 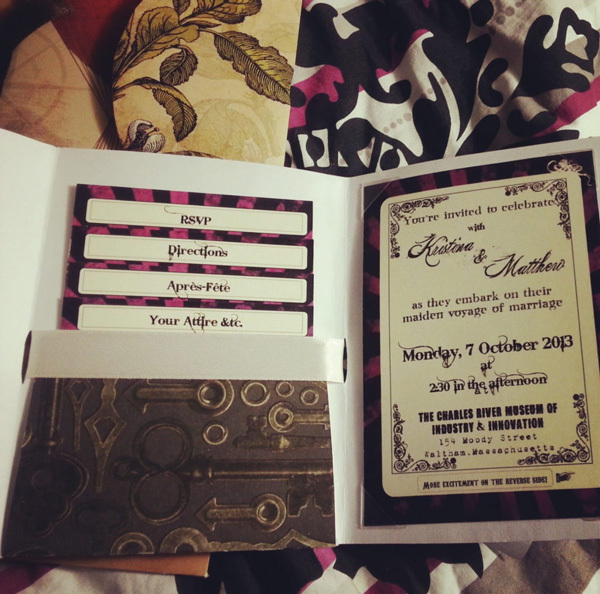 Steampunk invitations can follow tradition and add a bit of style at the same time. 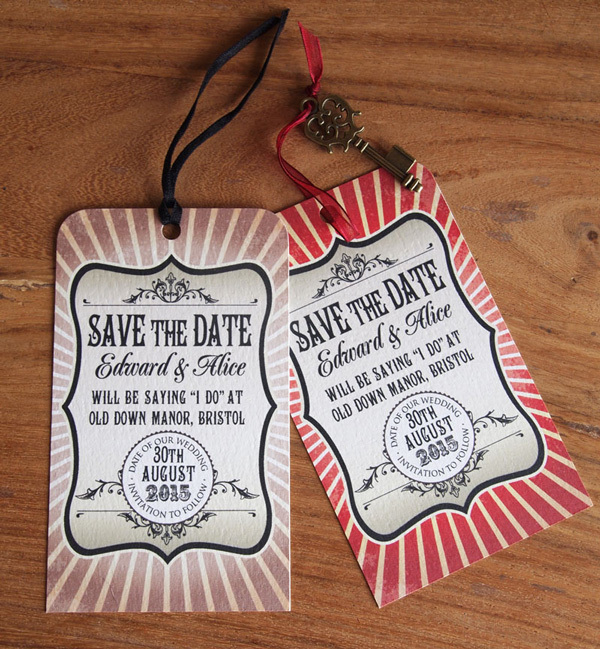 Whether you choose to go with a basic cog pattern in the background or to design a card that resembles a giant pocket watch you can make your invitations as simple or as complex as you would like. You can add embelishments to just the invitation or you can continue the theme on the outside of the envelope with sealing stickers that look like cogs or a keyhole. You can even add special touches like antique lace or give the paper a pattern appropriate for the period like Imperial Trellis or Toile. To the joy of wedding attendees everywhere, many modern weddings have replaced the old school engraved letter openers and lace bags of Jordan almonds with a photo booth. This can be as simple as a corner of the room draped with a backdrop and some props for fun photos or as complex as an actual portable photo booth that gives you traditional strips of four photos in a vertical line. You can provide props like top hats, parasols, and other Steampunk items to give your guests a fun favor that fits with your theme. Everyone loves to have pictures of themselves, whether they are framing them for their wall or simply uploading them to social media, making this an amazing way to give your friends and family something they actually want to take home from your wedding. This pairs perfectly with a picture frame as a wedding table number holder. You can choose a vintage frame or something specifically designed with Steampunk in mind to make sure your guests always remember your wedding with the same fondness you do. Weddings typically have some sort of edible favor for their guests to take home from the big event. This particular tradition is slowly falling out of favor, but the odds are still good that if you attend a wedding you will walk away with a bag of specially printed M&Ms, Jordan almonds in the couple's wedding colors, or individually wrapped after dinner mints. If you want to give people something a bit more substantial to enjoy on their ride home you can choose any number of treats, all of which can be given a Steampunk twist. Cupcakes can be given any number of Steampunk-inspired decorations - like these gorgeous ones from Elizabeth's Kitchen Diary. Cookies can be baked in any number of shapes (such as gears, or clocks), and you can print labels for any size bottle, which means you can add a Steampunk label to bottles of your favorite soda or beer so that your guests don't leave thirsty. The sky is the limit with this one, with everything from popcorn to cake pops showing up all over Pinterest and Etsy as possible favors, and the right packaging can make any of these items fit with your Steampunk theme. 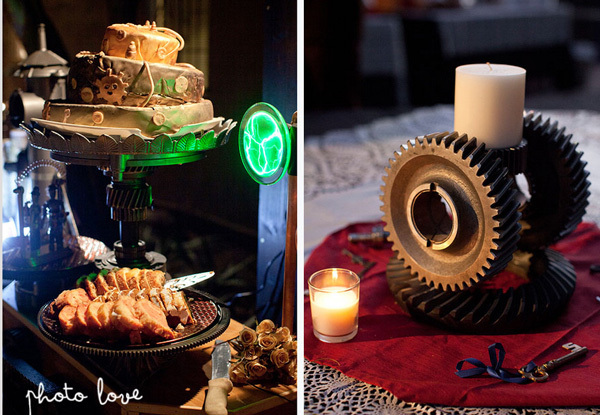 There are hundreds of awesome ways to add a Steampunk theme to your wedding favors. What are some of your favorite favors to receive at a wedding? Brides & BridesMaid Showing their Asses After Weddings Is the New Cool.